A former Labour MP has died of natural causes, aged 49. Fiona Jones won the Newark constituency in Nottinghamshire as one of "Blair's Babes" in 1997 when Labour won a landslide victory at the polls. She later found herself at the centre of a police probe amid claims she spent more on her election campaign than was allowed by law. She was discovered dead at her home in Saxilby, Lincolnshire, on 28 January. No inquest is expected. Mrs Jones served as a district councillor in West Lindsey between 1990 and 1994. She stood for Labour in the Gainsborough, Lincolnshire constituency in 1992 but finished third. Later she unsuccessfully tried to gain nominations for the safe Lincoln and Liverpool Riverside seats before she was selected to fight Newark. Almost immediately after she won the seat, the Liberal Democrats complained about her campaign and she was charged with electoral fraud. She was convicted at Nottingham Crown Court in March 1999 under the Representation of the People Act for false declaration of election expenses. Mrs Jones was sentenced to 100 hours' community service and temporarily stripped of her seat - but her conviction was thrown out on appeal. 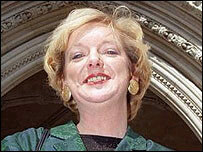 She returned to Parliament but lost to Conservative candidate Patrick Mercer in the 2001 general election. Later, after studying law at Lincoln University, she unsuccessfully tried to bring a civil case against Nottinghamshire Police over their investigation. A spokesman for Lincoln coroner's office said it was not expected that an inquest would be held into her death.